4 - 5 persons, non-smoker house, own sauna, garage, ski! Altogether the plant consists of 3 double wooden houses a two units. We are the owners of one of these houses, which we offer here for rent. All houses are also used by the owners at times and are very comfortably equipped. You do not need to bring bedding, towels or tea towels - everything is there! Our house has a spacious living and dining room with open kitchen (incl. Fridge-freezer, stove, oven, dishwasher). The upper floor has 2 bedrooms, one with a double bed and a south-facing balcony, one with 3 single beds, as well as the daylight bathroom with shower-tub and toilet. Furthermore, there is a guest toilet, as well as in the basement a private sauna, and an additional shower and a private garage with washing machine. High chair and cot are also available! Flatscreen satellite TV, free Wi-Fi and DVD Bluray player are also included. The house is a bio-wooden house and is heated by wood pellet heating. Montafon - The sports mecca! : The Montafon is THE destination for all who love (extreme) sports - in summer as in winter! WINTER: Our house is within walking distance of the Valisera gondola, which will take you to the largest ski area in the Montafon called SILVRETTA MONTAFON. There free daily parking is also plentiful. The ski bus stops directly in front of our house! Since December 2011, you can also take the NEW gondola directly to the Hochjoch - St. Gallenkirch so that was definitely the largest ski resort in Vorarlberg! Also recommended and also only 15 minutes (and Montafon ski pass included): the child-friendly areas and Gargellen Golm. Gargellen is also the most snow reliable ski area in the Montafon and is always 1 - 2 weeks longer open in spring than the other ski areas. Our house is located directly on the road to Gargellen, the ski bus will take you there in 10 minutes! SUMMER offers two 9-hole golf courses in the immediate vicinity. (Golf Club Schruns and Golf Club Silvretta). At the end of the valley is the legendary Silvretta High Alpine Road (closed in winter), which leads to Galtür and makes the hearts of motorcyclists and cyclists beat faster. The Montafon also offers fantastic conditions for enthusiastic mountaineers and hikers! Families also get their money's worth: Europe's longest and most modern summer toboggan run (Golm), etc. Own private sauna for up to 4 people, own private steam bath for 2 people! Own Garage! Your car stays free of snow! Plenty of things to do in this area and a nice and clean house to come back to each evening! We were in Sankt-Gallenkirch for one week with our two children of 5 and 3 years old. The house was very clean and has everything you need plus a cosy atmosphere. The kids also liked the large trampoline outside! When you stay here you get a BergePLUS pass which is very interesting especially if you have children of 8 years or older. Ours were a little too young for most activities but we'll keep this in mind if we come back later! There are however plenty of things to do for younger children too - several entertained discovery walks in the mountains, and also thrills such as the Alpine Coaster and the Mountain Carts. We enjoyed our week - it was even a bit too short! Make sure you read the brochure in the house carefully. We forgot to put on the boilers the evening we arrived so we did not have hot water the first morning. The host and the cleaning lady are very friendly and very helpful - we can highly recommend this place! Thank you so much, and please come back soon! You were lovely guests. We have rented this house for the second year and we will do so next year as well. The house is very comfortable, clean and cosy and provides enough space for a family of five. Sauna in the basement is a treat after a day in the mountains. It is a bit away from the centre of the village on foot but only 5 mins by car. A great place to spend your family ski vacation! Es ist alles vorhanden, was man für eine Urlaubswoche im Schnee braucht. Tolle Sauna samt Dusche. Schöne Schlafzimmer und großer Wohn-Ess-Bereich. Wenn sich dann der Pellets-Ofen wieder so regulieren läßt, dass man ihn nicht nach einer Stunde (fast wie in der Sauna) auschalten muss, ist alles perfekt. Die Lage ist ausgezeichnet, der Nachteil ist dass das Dorf zu Fuß weit ist und es viel Verkehr in der Nähe des Hauses gibt. Weiter gut. Es gibt viele lustige Aktivitäten in der Nähe. Küche und Ausstattung der Küche überaltert, Dusche im Sauna-Bereich Schimmel an der Decke. Sehr hellhöriges Haus und keine Heizung für Skischuhe. Ich finde es absolut unmöglich, dass Sie hier nur einen Stern geben. Wenn Sie Schimmel entdeckt haben, hätten Sie dies sofort melden können. Die Küchenausstattung ist überdurchschnittlich und fehlende Skischuh Wärmer sind wohl kaum ein Grund, unsere Unterkunft derart zu verreißen. Einfach nur schade. La maison est grande, bien équipée et très bien située pour profiter des téléphériques. Nous avons acheté La montafonbrandental carte pour la semaine Et avons fait des ballades magnifiques. Je conseille vivement cette carte, surtout avec les enfants. De plus, avec cette carte nous avons accédé gratuitement à la piscine située à 500m de la maison, ce qui était très appréciable par le beau temps. Dans la maison il a aussi une sauna privée - un vrai plus. Je conseille vivement cette location. Silvretta Nova, near the base terminal, skiing, snowboarding, Schruns, and snow, mountain biking, hiking, golf, tennis, family, swimming, paragliding, paragliding, motorcycle, mountains, alps, mountain climbing, mountain panorama, central, family-friendly. Also recommended is the beautiful 9-hole golf course in the Brandner with great pro shop (15 km). Ski: Our house is within walking distance to the Valisera gondola that takes you to the largest ski area in Montafon, named Silvretta Montafon. There free daily parking is also plentiful. The ski bus stops directly in front of our house! Since December 2011, you can NEW from there with the NEW gondola ride directly to Hochjoch - St. Gallenkirch so that was definitely the largest ski resort in Vorarlberg! Also recommended and also only 15 minutes (and Montafon ski pass included): the child-friendly areas and Gargellen Golm. Gargellen is also the most snow ski resort in the Montafon Valley in spring has always 1 - 2 weeks open longer than the other ski areas. 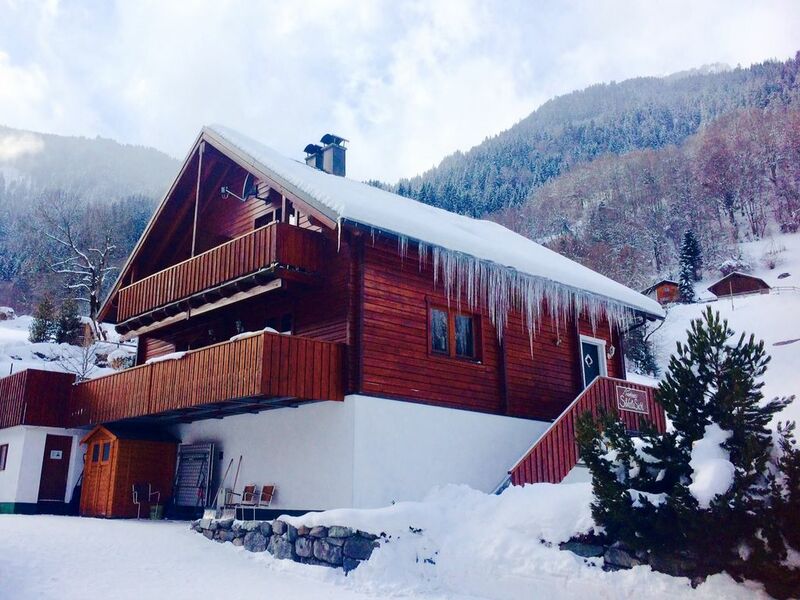 Our house is located on the road to Gargellen, the ski bus takes 10 minutes to go there! Wir vermieten NUR Samstag bis Samstag! Alle Mietpreise verstehen sich inkl. W-LAN, Handtüchern & Bettwäsche, Strom & Gästetaxe. Jeweils hinzu kommen € 85 für die Endreinigung, die in bar vor Ort bei Abreise zu begleichen sind. Danke für Ihre freundliche Kenntnisnahme!